Although the general view of Discharge’s discography goes sharply downhill once you take Hear Nothing See Nothing Say Nothing out of the picture, there’s still some gems to be found here and there, and it’s good of Candlelight to put some re-releases together. This is the first, a re-recorded best-of originally from 2008 that compiles tracks from the band’s earliest and best years into a rollicking ride. The only real problem with it is that it’s a re-recording, and swaps the youthful rage of the originals for a more grown-up, live-in-the-studio roughness that simply can’t be as effective. Still, Discharge more than have the raw ingredients to make a killing, and the riff-driven speedy punk on show here (I’ve called them ‘early thrash’ in the past with good reason) is still exciting stuff, especially by the time you get to Hype Overload with its howling solo. As well as the studio tracks and some ‘bonus’ additions at the end, you get some live recordings , and it’s these that I enjoyed the most, having more of that traditional energy that I associate the band with. From the background crowd noise, you get the feel of a great live show, something captured well here. The songs played are better, too – The Nightmare Continues, Hell On Earth, Doomsday to name just three. A quick word on the bonus tracks, which are slightly longer (two-three minutes as opposed to one-two) and slightly more structured than the average Discharge blast – these are enjoyable enough, and help to show the direction of the band in more modern times, such as on their latest Disensitise album (also reissued by Candlelight, and due to be reviewed another time). 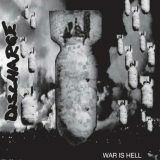 All in all, War Is Hell is a good slice of punk from Discharge that will be of definite appeal to newcomers. I can’t help but think that they’d be better off skipping this and going straight to Hear Nothing See Nothing Say Nothing, however, as the perfect snapshot of the band at their best. Good but inessential, is probably the best way to describe it.